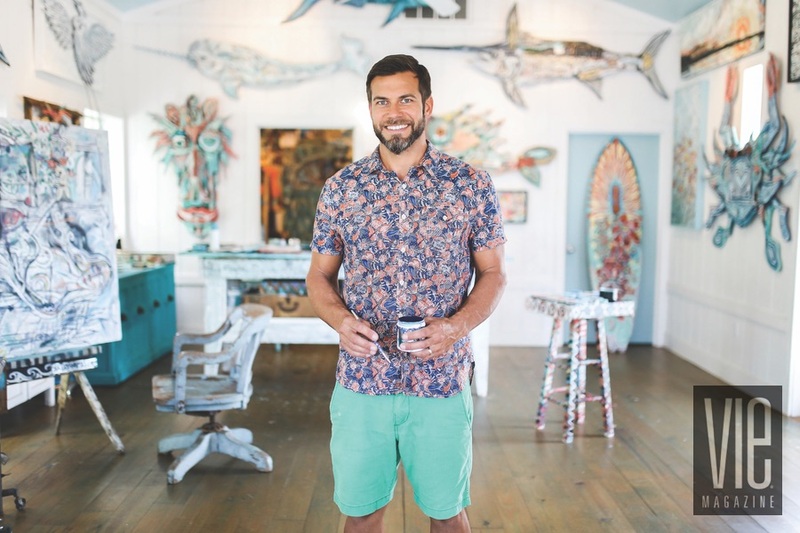 Saczynski loves creating something new from found objects such as musical instruments, surfboards, tools, reclaimed wood, and other items. Visit his studio-gallery to see more. If you throw something out around Andy Saczynski, prepare to see it again—in one of his hotly collected art pieces. Saczynski has built an award-winning career on turning found objects into masterpieces; in the process, he has attracted ardent fans and collected an extensive list of impressive honors. 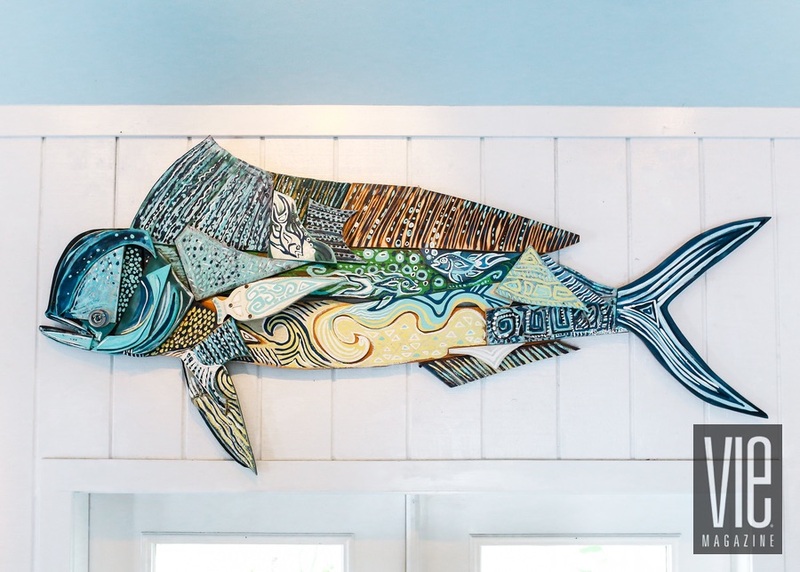 The Northwest Florida artist has also captured the attention of a major baking brand, who added his work to its packaging. Was his style an ingenious, carefully designed scheme to carve out a niche in the crowded art world? Nope. He was simply being resourceful. He and his wife, Lori, were expecting their fifth child, and Saczynski, who had been gritting his teeth through a series of nine-to-five jobs, had reached a point where he just couldn’t go another day without making art. Canvas was expensive, he knew, but things that people toss out are free. 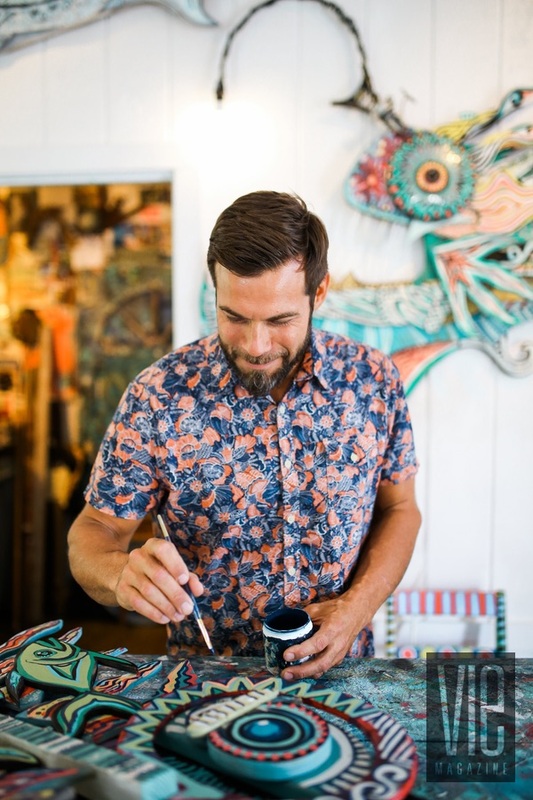 Living in such a creatively rich space with staunchly supportive parents, Saczynski confidently set his sights on an art career and, from an early age, had a clear vision for his life that’s remarkably similar to what he’s doing now. But it hasn’t been an easy road to fulfilling that vision. There was a stretch when he gave up on everything he’d ever wanted for his career, believing it was time to “grow up.” He confesses to falling victim to the barrage of negativity that pummels artists: it’s just a hobby . . . you’ll never make money at it . . . get a real job. He tried other jobs, but he was miserable. Desperate to regain the sense of wholeness he felt while creating, Saczynski decided to accept what he’d always known: he is an artist. Admittedly, with baby number five on the way, his timing wasn’t great. But Saczynski went to work on his assemblage art in 2010, producing as many pieces as he could and showing them wherever anyone would let him. 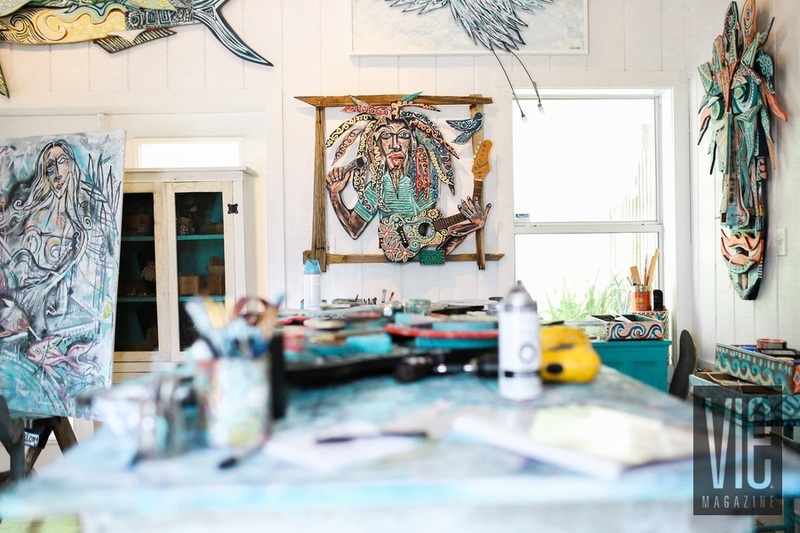 Two years later, he opened the Andy Saczynski Studio-Gallery at the Shops of Grayton just off Scenic Highway 30-A in Grayton Beach, Florida. In fact, it was because of his family that he decided to launch a studio. 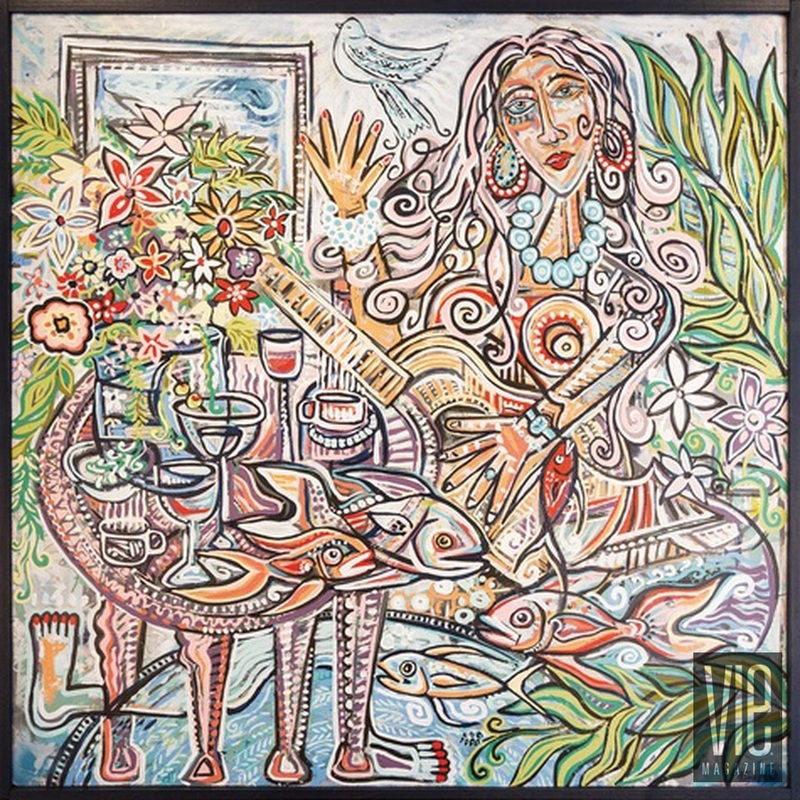 Many artists spend a significant amount of time on the road, entering their work in shows across the country to raise their profile and, of course, sell pieces. Saczynski was one of them. 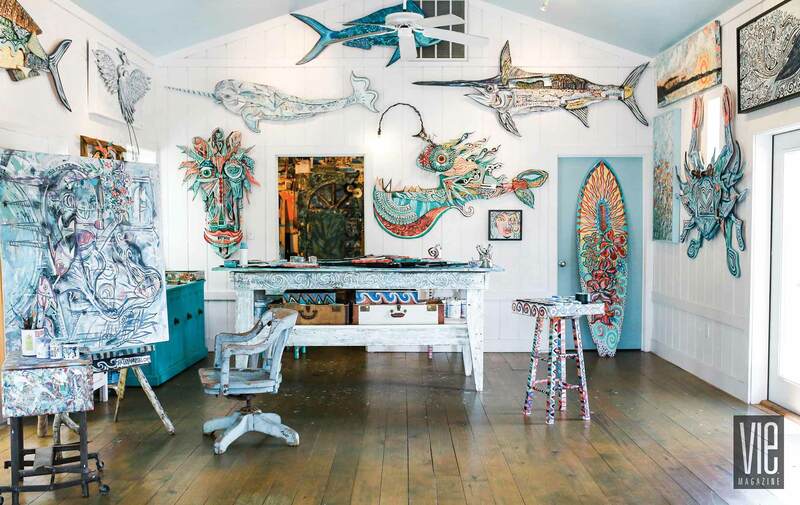 But the people at home needed him, and a gallery-studio allowed him to create and sell his work from his beloved coastal hometown. Home, of course, comes with Gulf-sized inspiration for an artistic style that’s as difficult for Saczynski to peg as it is for art critics. 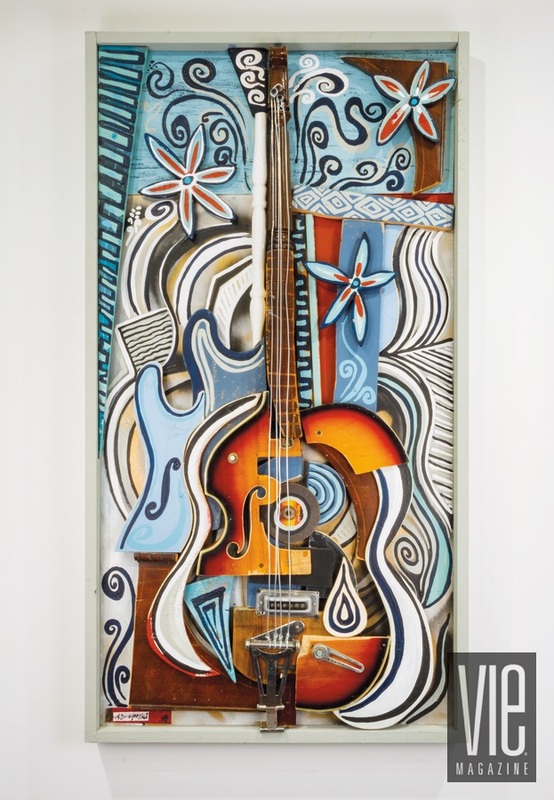 Folk art, outsider visionary, cubism—he’s heard all of those descriptions and more. 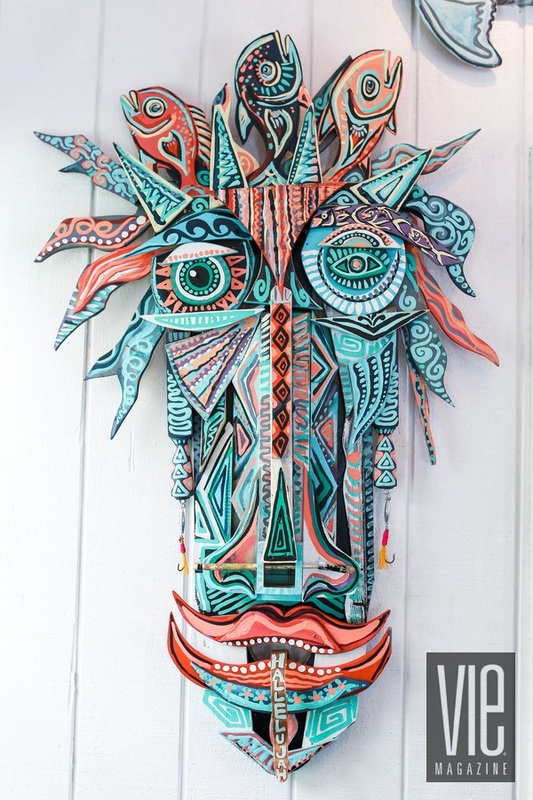 His preference is “mixed media assemblage art” because, while he does incorporate painting, his work is mostly sculptural, using found objects and recycled materials. 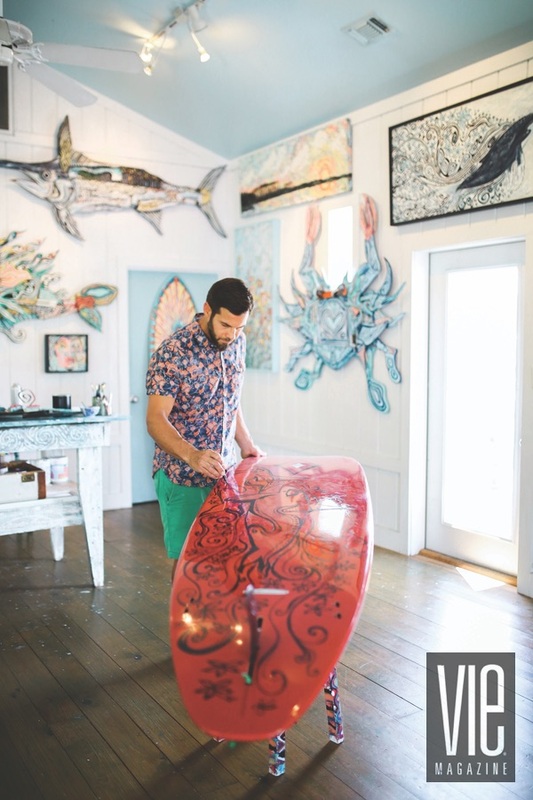 His pieces might start as other people’s trash, but the treasures that follow have garnered Saczynski awards like 2013 South Walton Artist of the Year and Best Local Artist three years in a row, as well as earned him a place among the hottest artists on the 30A Hot Spot Awards list for 2017. Soft spoken and thoughtful, Saczynski glosses over his popularity and critical acclaim in a way that makes you wonder, “Does he know he’s actually a pretty big deal?” He seems genuinely stunned by each of his awards, citing the exceptional caliber of artists in southern Walton County. Yes, the competition is stiff, which is why his dozen-plus awards (and counting) should tell Saczynski what the rest of us knows: he’s officially a power player. He was especially surprised by his Artist of the Year award, which came just a year after launching his gallery. It was a major boost to his confidence at the time, but also a major boost to his career. Thanks to the contacts he made and shows he attended as a result, he caught the eye of the people behind Immaculate Baking Company. They loved his art so much that they featured it on some of their product packaging. Visitors are welcome to stop by Andy Saczynski Studio-Gallery in Grayton Beach, Florida, to peruse the art and watch Saczynski work. 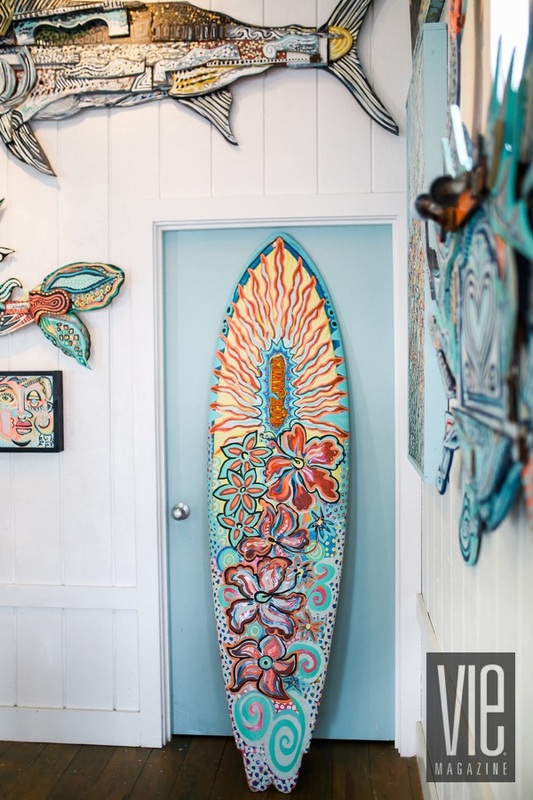 The fluidity is no accident, considering that much of his inspiration comes while on a surfboard. There, separated from life on shore while riding wave after turquoise wave, his mind is free to roam, take in the sea life, and let new concepts take root. Those concepts have changed a bit over the years as his style has evolved. Bold, primary colors marked most of his early pieces, while a blue-green-yellow palette took over during an active period of painting Western Lake scenes. His subjects, too, have ranged from gators to guitars and Johnny Cash. But no matter the color or the subject, it’s easy to recognize a Saczynski piece—and not just because he’s the only one who could fashion a mask out of a broken ukulele and a piano pedal. There’s an underlying him-ness to everything he creates. And he’s pleased about that. Saczynski doesn’t feel a need to prove anything by switching up his artistic identity simply for the sake of being “different.” He readily acknowledges that his sculptural work, especially, will likely always be part of his repertoire because it best expresses his cumulative experiences and combines all the elements of his style. We hear you loud and clear, Andy.